Cambodian (or Khmer) cuisine is an exotic fusion of Chinese, Indian & French influences, harmoniously combined into something uniquely Khmer. The food is light, delicate & healthy. An emphasis is placed on freshness of ingredients & simplicity in cooking, allowing the complex aromas, textures & flavours to shine. The core flavours are subtle, a blend of salty, sweet & sour utilising lemongrass, galangal, lime leaves, turmeric, tamarind and a range of Asian herbs. 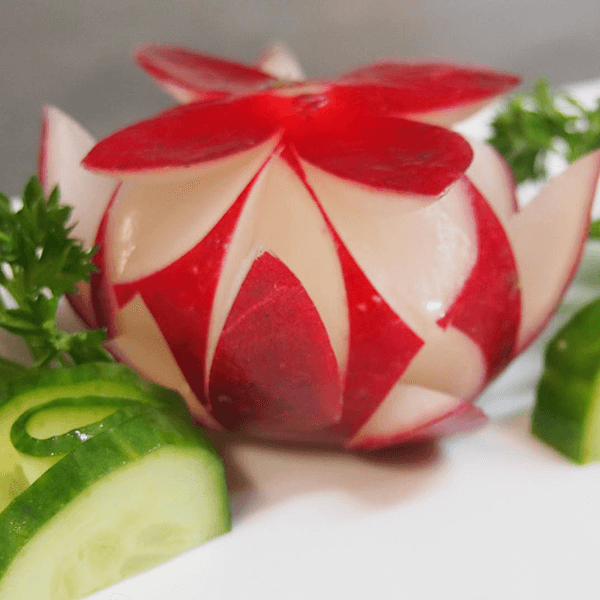 We also cater for vegetarian and gluten free diets, please let us know when ordering if you have a special diet and our chef will be more than happy to see what he can do for you. Due to the nature and freshness of our cooking, the food will be served as soon as it is prepared. For maximum enjoyment we encourage diners to start their meal when it arrives. We hope you enjoy the Angkor experience. Prawns stir-fried with mixed vegetables & garlic, served in a sizzling plate. Beef pieces marinated in five spices, served on crispy noodles. Khmer style prawn paste spread on bread, topped with sesame seed & deep fried. Rice paper wraps with chicken, lettuce, mung beans, vermicelli noodles and shrimp served with Khmer sweet and sour sauce. 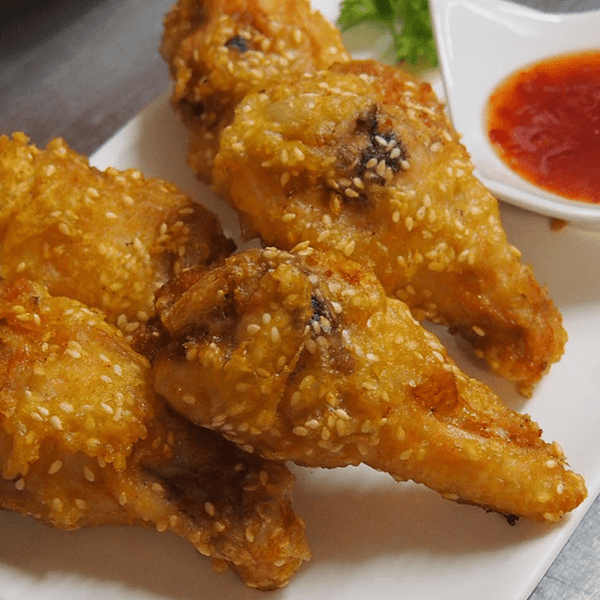 Deep fried, battered chicken wings served with sweet chili sauce. Pork and vegetable filling, served with sweet chili sauce. Fresh mushroom stuffed with pork and vegetable filling, battered and deep fried. Chicken, eggs and sweet corn. Khmer spicy soup with lemon juice and lemongrass. Stir fried in satay peanut sauce, with seasonal vegetables and pineapple. Battered steak strips in sweet and sour sauce. Prawns stir fried with seasonal vegetables and garlic. Stir fried with freshly chopped ginger, pineapple and seasonal vegetables. Sliced beef and vegetables in Cha Siu sauce. Battered pork strips in chili plum sauce. 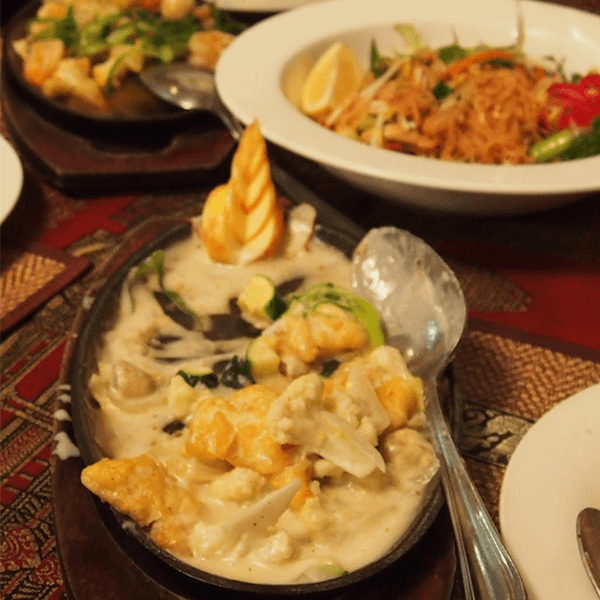 Battered fish pieces in fresh Khmer style chili and coconut sauce. Stir fried with fresh lemon grass & lime kaffir leaves with seasonal vegetables. 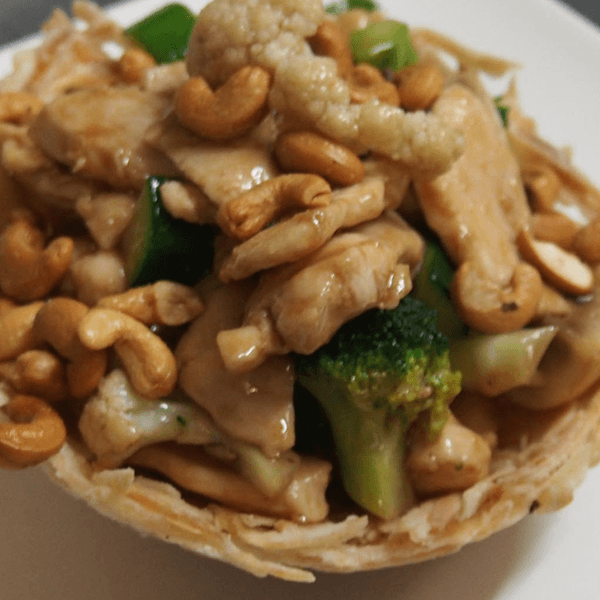 Stir fried with oyster sauce and seasonal vegetables, served in a crispy potato basket, topped with cashew nuts. Combination option includes BBQ pork, prawns, mussels, scallops and squid. 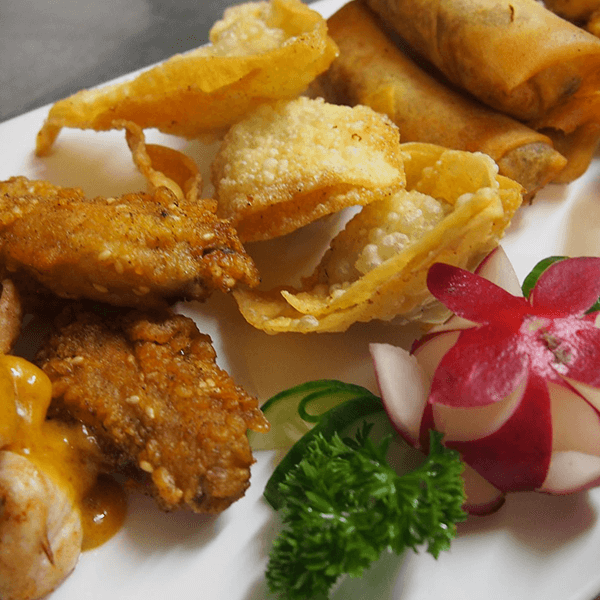 Battered chicken in honey sauce served on crispy noodles. Khmer style beef pieces stir fried with onion and served with salad, lettuce, cucumber and tomato. Crispy pork pieces mixed in sweet and sour sauce. Khmer style omelette with choice of meat and vegetable filling topped with Angkor soy sauce gravy and crispy noodles. Grilled chicken served with seasonal steamed vegetables and Angkor soy sauce gravy. BBQ marinated pork, served with steamed vegetables. Green curry with vegetables served with rice. Red curry with vegetables served with rice. Battered prawn and squid, deep fried and seasoned with salt and pepper, served in a potato basket with dipping sauce. Battered prawns in honey sauce served with crispy noodles. Prawn, squid, scallop and mussels and tofu with Chinese vegetables. Pan fried fish, served with Khmer style ginger and soybean paste with onions. Served with steamed vegetables and Angkor soy sauce gravy. Crispy noodles topped with your choice of meat and vegetables. Combination option includes Prawns, mussels, scallops and squid. Thick egg noodles stir fried with vegetables, seafood, beef, chicken and pork. 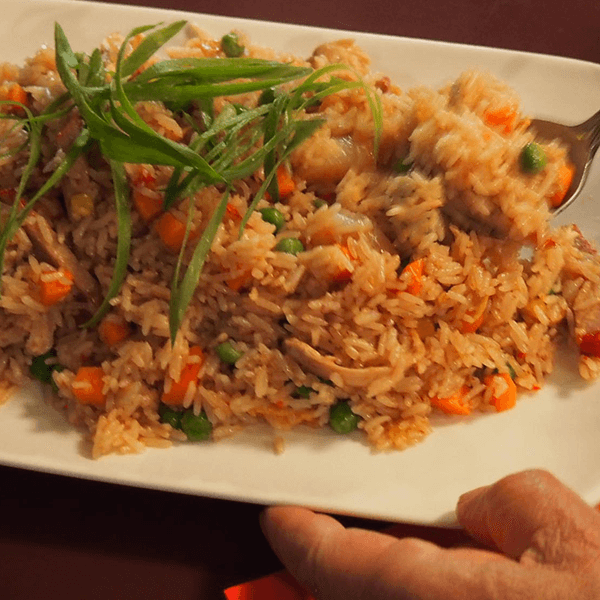 Khmer style stir fried rice with mixed vegetables. Khmer prawn Laksa soup served with thin rice noodles. Your choice of soft stir fry noodles or crispy noodles. Combination option includes prawns, mussels, scallops and squid. Khmer style rice noodles stir fried topped with peanuts. Stir fried Vermicelli rice noodles with vegetables and BBQ pork and curry powder. 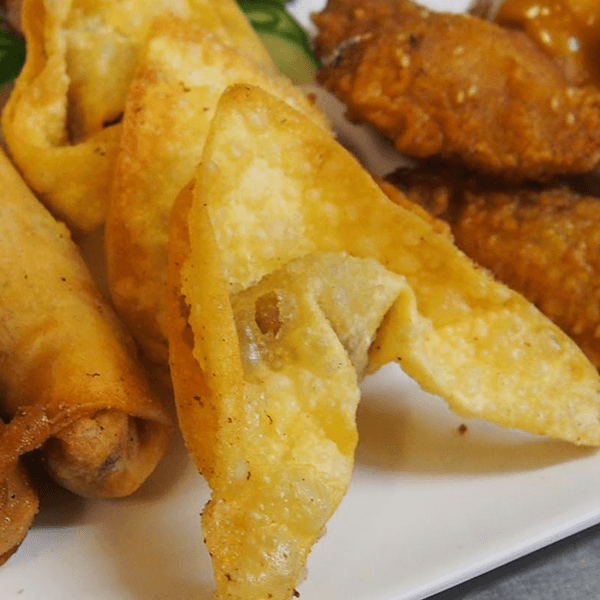 Battered and deep fried served with sweet chili sauce. Khmer spicy soup with vegetables, lemon juice and lemon grass. Rice paper wraps with lettuce, mung beans, carrots, cucumber and Vermicelli noodles served with Khmer sweet and sour sauce. Khmer soup, slightly sour, in our special broth with vegetables, pineapple, garlic and tamarind. Thin egg noodles, your choice of soft stir fry noodles or crispy noodles. Stir fried with fresh lemon grass & lime kaffir leaves with seasonal vegetables. Tofu optional. Stir fried with freshly chopped ginger, pineapple and seasonal vegetables. Tofu optional. Battered and deep fried and seasoned with salt and pepper, served in a potato basket with dipping sauce. Green or Red curry with vegetables served with rice. Stir fried with chili paste and seasonal vegetables. Tofu optional. Stir fried in satay peanut sauce, with seasonal vegetables and pineapple. Tofu optional. Khmer Laksa soup served with thin rice noodles. Enjoy our menu at home! 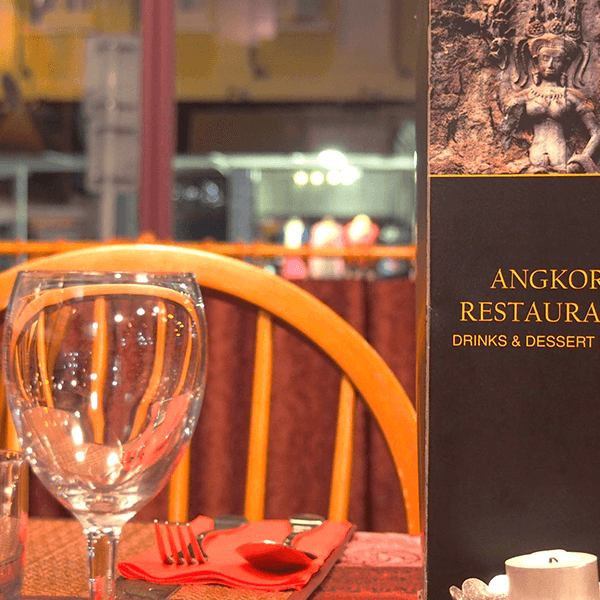 You can now enjoy your favourite Angkor meals at home. Simply order online by clicking here and your food will come to you.